The present invention relates to a kind of polyethylene glycol derivate with Y type branch represented by formula (I)-(IV). The present invention also relates to compound with medicines medical composite comprising above compound. The present invention relates to Y-shape branched hydrophilic polymer derivatives, their preparation methods, and conjugates of the derivatives and drug molecules, especially proteins and polypeptides. This invention also relates to pharmaceutical compositions comprising the conjugates. Natural and recombinent proteins and polypeptides have been used as medicines. The products after purification and separation can be used to treat specific diseases by parenteral routes. When administered parenterally, however, proteins may have immunogenecity, or be relatively insoluble in water, or have short pharmacological half-lives. How to raise and keep a highly effective serum concentration in vivo is of significant importance. In addition to proteins, clinically there is necessity to modify other constituents of natural medicine such as flavonoids, terpenoids, anthraquinones, steroids and alkaloids to prolong their physiological half-lives, enhance their stability and the possibility to reach the target site, raise their solubility in water, change administration routes and improve bioavailability. Recently PEG has been widely used to conjugate proteins, peptides or other therapeutic agents, in order to prolong their physiological half-lives and lower their immunogenicity and toxicity. Clinically, PEG and its derivatives have been widely used as carriers in the manufacture of pharmaceutical preparations of commercial drugs. The methods for conjugating PEG to drug molecules has made much progress in the last 10 years and had been applied to many officially approved drugs. For example, PEG-intron®, a conjugate of PEG to a -interferon, exhibits longer circulation half-life and better therapeutic effect. The conjugate of PEG to paclitaxel reduces the toxicity and increases the bioactivity. The metabolism of PEG is well known, and PEG is accepted as a safe drug modifier. One process called PEGylation is often applied when conjugating PEG to drugs. Namely, one or two of the terminal groups of the PEG are activated to form a proper functional group, which is reactive to at least one functional group of the drugs, and can form a stable bond with it. Many PEG derivatives have been reported. Linear PEG propionic acid, butanoic acid and their NHS esters have been reported in US patent No. 5672662 . Recently a U-shape branched PEG is reported in US patent No. 5643575 . In these PEG derivatives, two linear PEGs link to one molecule or structure through two identical functional groups, such as two amino groups or two carboxyl groups. In one example of the patent, the branched PEG is derived from linear PEG and lysine, which is a kind of amino acid having two amino groups. F is a functional group selected from the group consisting of a hydroxyl group, a carboxyl group, an ester group, carboxylic acid chloride, hydrazide, maleimide and pyridine disulfide, being capable of reacting with an amino group, a hydroxyl group or a thiol group of a therapeutic agent or a substrate to form a covalent linkage. derivatizing the new hydroxyl group to incorporate the terminal group F.
reacting the product obtained above with another methoxyl polyethylene glycol derivative, and further derivatizing to incorporate a terminal group F.
According to still another aspect of the invention, there is provided conjugates of the above polymer derivatives and drug molecules through the functional group F.
According to still another aspect of the invention, there is provided pharmaceutical compositions comprising the above conjugates. Fig. 1 shows the synthesis of Y-shape branched polyethylene glycol derivatives (1). Fig. 2 shows the synthesis of Y-shape branched polyethylene glycol derivatives (2) and (7). Fig. 3 shows the synthesis of Y-shape branched polyethylene glycol derivatives (5). Fig. 4 shows the synthesis of Y-shape branched polyethylene glycol derivatives (6). Fig. 5 shows the synthesis of conjugates of Y-shape branched polyethylene glycol derivatives (1) and drugs (through ester bonds). Fig. 6 shows the synthesis of conjugates of Y-shape branched polyethylene glycol derivatives and drugs (through other bonds). Fig. 7 shows the synthesis of conjugates of Y-shape branched polyethylene glycol derivatives and proteins. In the present invention, the hydrophilic polymer is, for example, a polyethylene glycol, a polypropylene glycol, a polyvinyl alcohol, a polyacrylmorpholine or a copolymer thereof, especially preferred are a polyethylene glycol and copolymers thereof. n is an integer, representing the degree of polymerization, preferably making the molecular weight of PEG is 300 to 60000. In formula (V), R is preferably H, methyl, ethyl, isopropyl, cyclopropyl, cyclobutyl, cyclohexyl or benzyl. The Y-shaped branched hydrophilic polymer derivatives of the present invention are preferably prepared by attaching two linear PEG chains to an amino group of a small molecule. 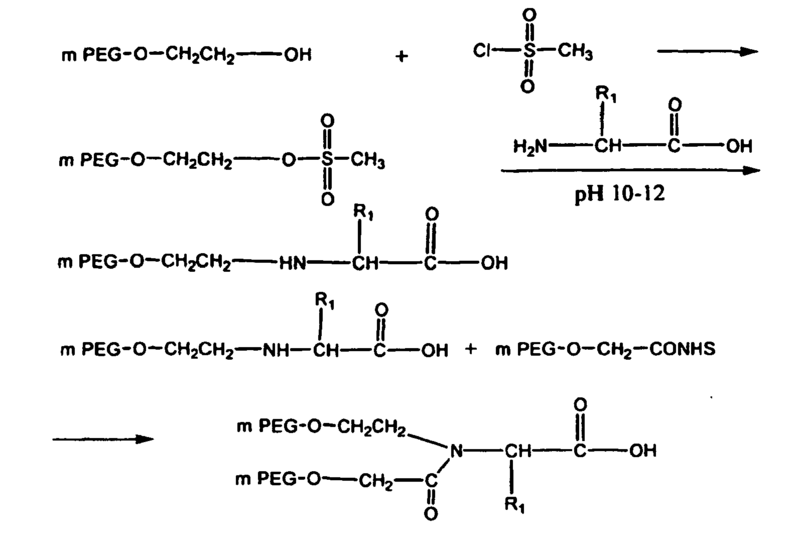 PEG is used here as an example to illustrate the preparation of Y-shaped branched hydrophilic polymer derivatives of the present invention. n is an integer, representing the degree of the polymerization. As a lower alkyl, R can be any lower alkyl group having 1-6 carbon atoms, for example, methyl, ethyl, n-propyl, iso-propyl, n-butyl, iso-butyl, n-pentyl, or n-hexyl. As a cycloalkyl, R is preferably a cycloalkyl containing 3-7 carbon atoms, for example, cyclopropyl, cyclobutyl, and cyclohexyl. Among those, cyclohexyl is more preferable. The typical compound is methoxy-polyethylene glycol (mPEG). Other analogs and derivatives of polyethylene glycol, such as polypropylene glycols, polyvinyl alcohols, and polyacrylmorpholines and the like, can also be used in the present invention. In respect of PEGs, they are usually measured by molecular weight. It is preferred that the molecular weight of PEG which forms the conjugates falls in the range from 300 to 60000 Daltons, which means n is about 6 to 1300. It is more preferred that n is 28, 112 and 450, respectively corresponding to molecular weight of 1325, 5000, and 20000. Because of the potential non-homogeneity of the starting PEGs which are usually defined by their molecular weights rather than the self-repeating unit n, PEGs are normally characterized with a weight average molecular weight, rather than their self-repeating units represented by n. The starting PEG compounds with different molecular weights are readily synthesized using methods known in the art or they are commercially available. The Y-shape PEG derivatives of the present invention can be synthesized and prepared by general methods in this field. The different compounds claimed in the invention are synthesized and prepared by known methods, which can be found in the technological literatures and patents in this field. This compound can be obtained from stepwise reactions of a PEG with a compound containing an amino group. The selected compound containing an amino group can be an amino acid, an amino ketone or another molecule having an amino group. The standard preparation route is illustrated below. However, there are other standard methods useful for preparing this derivative that are known in this field. 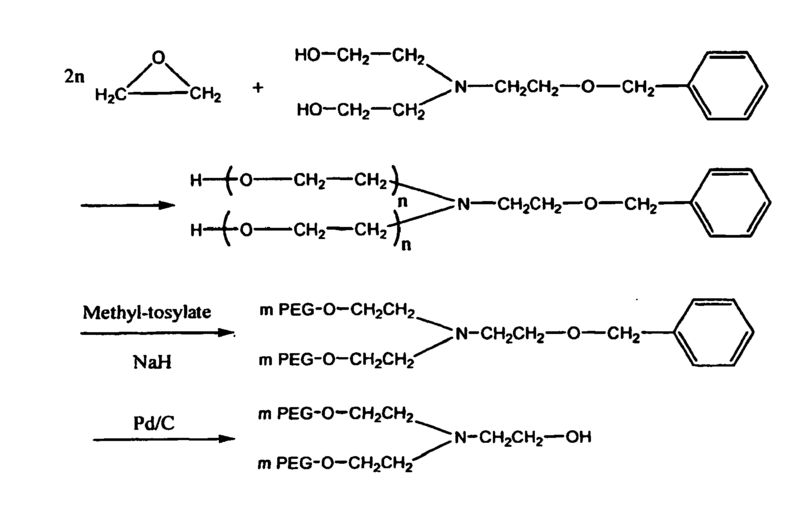 Because of greater reactivity of amino groups over hydroxyl groups, the aminated PEG derivatives are important in reacting with a molecule having a carboxylic acid group to yield a conjugate. Carboxylation helps to improve PEG's reactivity and makes it capable of conjugating to molecules having amino or hydroxyl groups. If an amino acid is used as a starting material, the terminal group of the resulting Y-shaped PEG will have a carboxylic group. Especially, if multiple carboxylic acid containing amino acids or polymers are used, the terminal groups will have several carboxylic acid groups. This kind of structure is useful to increase the load of small natural drug molecule and achieve a slow-release effect by stepwise degradation. Other modification, for example, by acid chloride, hydrazine, maleimide, pyridine disulfide and the like can be appropriately adopted as well to obtain corresponding derivatives. Other preparation methods in this field will be apparent to those skilled in this are. Many components of natural drugs have active functional groups such as amino, carboxyl and hydroxyl groups, which bind with monosaccharides, polysaccharides, nucleosides, polynucleosides, phosphoryl and the like in vivo, to form active pharmacological structures. Similarly, the PEG derivatives with the modified terminal functional group can conjugate to the drug molecules in the same way to take the place of a bio-organic molecule and overcome the shortcomings of short physiological half-lives and low therapeutic effect. The following model is a general ester synthesis reaction. An ester group can be eliminated by biodegradation in vivo to release the active ingredient. An amide group is relatively stable in vivo. The Y-shape hydrophilic polymer derivatives of the present invention can form conjugates with drug molecules through proper functional groups. These functional groups can link the free amino, hydroxyl or thiol group of proteins, polypeptides and other natural drugs with the polymer derivatives. For proteins and peptides with high molecular weight, one molecule can link with one or more PEG derivatives to improve the physiological effects of the drug molecules in vivo. For the active components of a natural drug with low molecular weight, one PEG derivative can be linked to one or more drug molecules through proper functional groups to ensure a proper drug concentration and the function of sustained release. The applications described above offer some possible reference models for medical application of the PEG derivatives. The choice of proper derivatives for real applications can be confirmed by using animal pharmacology, toxicology, clinical study and other such approaches. Preferably, the drug molecules included in the conjugates of the present invention are the active ingredients separated from nature plants, such as paclitaxel, camptothecin, cinobufagin, clycyrrhetinic acid and scopoletin. Preferably, the drugs are the ingredients of natural medicines used in the treatment of tumors, such as paclitaxel, camptothecin, and derivatives thereof. Prefered drugs also include interferons, such as α - and β - interferon. The conjugates of the present invention can be administered in the form of pure compounds or suitable pharmaceutical compositions, via any acceptable routes or being included in a reagent for similar use. Thus, the conjugates can be administered via oral, nasal, parenteral, topical, transdermal, rectal or injection routes in the form of solid, semisolid, lyophilized powder or liquid, for example, tablets, suppositories, pills, soft and hard gelatin capsules, powder, solution, suspention and aerosols. Preferably the unit dosage form is suitable for a precise-dosage and easy administration. The composition includes conventional pharmaceutical carriers or excipients and the conjugate(s) of the present invention as the active ingredient(s). Furthermore, it also can include other agents, carriers and excipients. Generally speaking, depending on the method of administration, the pharmaceutically acceptable compositions will include about 1-99 wt.% of the conjugate of the present invention, and 99-1 wt. % of suitable pharmaceutical excipient. Preferably they include 5-75 wt. % of the conjugate and the rest is any suitable pharmaceutical excipient. The preferable way of administration is injection with a general daily dosage scheme, which can be adjusted based on the severity of the disease to be treated. The conjugates of the present invention or their pharmaceutically acceptable salts may be formulated in the dosage for injection by, for example, dissolving 0.5-50% of the active components in a liquid pharmaceutical carrier, such as water, saline, aqueous glucose, glycerol, ethanol and the like to form a solution of suspension. The compositions which can be administered as liquid such as solutions and suspensions can be prepared by dissolving and dispersing the conjugate of the present invention (about 0.5-20%) and optionally a the pharmaceutical excipient into a carrier. Example of carriers includes water, saline, aqueous glucose, glycerol, ethanol and the like. If needed, the pharmaceutical composition of the present invention can further include an adjuvant in a small amount, such as wetting agent, emulsifier, pH buffer, antioxidant and the like. For example, citric acid, sorbitan monolaurate, triethanolamine oleate, butylated hydroxytoluene and the like can be added. The practical preparation methods of such dosage forms are known or obvious to the skilled in the art. For example, see Ramington's Pharmaceutical Sciences, 18th edition, (Mack Publishing Company, Easton, Pennsylvania, 1990). In any case, according to the techniques of the present invention, the composition applied will include an effective amount of the conjugate of the present invention for the treatment of corresponding disease. The polymer derivatives and the conjugates of the present invention and their preparation methods will be further described by the following examples. These examples do not intend to limit the scope of the invention by any means. The scope of the present invention can be determined by the claims. 5 g of (PEG)2-N-CH2CH2O-Bz (molecular weight is 10000, obtained from above step) was dissolved in 50 ml toluene. 0.1 g of sodium hydride and 0.5 g of benzene sulfonic acid methyl ester were added to the solution. The reaction mixture was heated at 80 °C for 24 hours. Then the solution was quenched with 2 ml of isopropyl alcohol. The solvent was removed under vacuum and the residue was added to 200 ml of isopropyl alcohol. The precipitate was collected by filtration and dried in vacuum. Yield: 4.6g (92%), Mp: 57-59°C. 3 g of (MeO-PEG)2-N-CH2CH2O-Bz (molecular weight is 10000, obtained from above step) was dissolved in 30 ml of anhydrous 1,4-dioxane. Then, 0.1 g of Pd/C was added to the solution mixture as catalyst and H2 gas (40 psi) was introduced into the reactor. The solution was vigorously stirred at room temperature overnight. The catalyst was removed by filtration and was washed with fresh dichloromethane. The solvent was removed by rotary evaporation and the residue was added into ethyl ether. The precipitate was collected by filtration and dried in vacuum. Yield: 2.4g (80%). NMR(DMSO): 3.5 (br m, H in PEG), 3.24 (s, 6H), 2.63 (t, 6H). 5g mPEG of molecular weight 5000 was dissolved in 50ml toluene, azeotropically distilled for 2 hours under the protection of nitrogen, with 10 ml solution being distilled off, and then cooled to room temperature. 3 ml of dry dichloromethane and 0.08ml dry triethylamine were added to the reaction. The mixture was cooled in an ice-water bath and 0.12 ml of dry methanesulfonyl chloride was added dropwise. The mixture was stirred at room temperature under the protection of nitrogen overnight. The reaction was quenched by adding 2 ml of absolute ethanol. Part of the solvent was removed by rotary evaporation, the precipitate was collected by filtration, and then 150 ml ethyl ether was added. The precipitate was collected by filtration and dried in vacuum. Yield: 4.8g (96%). NMR(DMSO): 3.5 (br m, H in PEG), 3.24 (s, 3H), 4.32 (t, 2H). 2g of glycine hydrochloride was dissolved in 20ml of deionized water. 1g of NaOH was added to the glycine solution to adjust the pH to 10.5. Then 2 g of mPEG mesylate ester of molecular weight 5000 (obtained from above step) was added to the solution. The solution was incubated at 37°C for 72 hours, and then neutralized by hydrochloride solution to pH about 7. The polymer was extracted with dichloromethane. The organic phase was dried with anhydrous sodium sulfate and the solvent was removed under vacuum. Yield:1.7g (85%), Mp: 55-57°C. NMR (DMSO): 3.5 (br m, H in PEG), 3.24 (s, 3H), 2.95 (t, 2H), 3.11 (s, 2H). 5g mPEG of molecular weight 5000 was dissolved in 50 ml of toluene, azeotropically distilled for 2 hours under the protection of nitrogen with 10 ml solvent being distilled off, and then cooled to room temperature. 3 ml of dry dichloromethane and 0.08 ml of dry triethylamine were added to the reaction. The mixture was cooled in an ice-water bath and 0.12ml dry methanesulfonyl chloride was added dropwise. The mixture was stirred at room temperature under the protection of nitrogen overnight. The reaction was quenched by adding 2ml of absolute ethanol. The solvent was removed by rotary evaporation, the precipitate was collected by filtration, and then 150 ml ethyl ether was added. The precipitate was collected by filtration and dried in vacuum. Yield: 4.5g (90%). NMR (DMSO): 3.5 (br m, H in PEG), 3.24 (s, 3H), 4.32 (t, 2H). 2g of alanine hydrochloride was dissolved in 20 ml of deionized water. 1 g of NaOH was added to the alanine solution to adjust the pH to 10.5. Then 2g of mPEG mesylate of molecular weight 5000 was added to the solution. The solution was incubated at 37 °C for 72 hours, and then neutralized with hydrochloride solution to pH about 7. The polymer was extracted with dichloromethane. The organic phase was dried with anhydrous sodium sulfate, and the solvent was removed under vacuum. Yield: 1.9g (94%), Mp: 55-57°C. NMR (DMSO): 3.5 (br m, H in PEG), 3.24 (s, 3H), 2.94 (m, 1H), 1.24 (d, 3H). The synthesis is shown in Fig. 3. 1 g of mPEG-glycine (3) or mPEG-alanine (4) of molecular weight 5000 (from example 3 or 4) was dissolved in 20 ml of dichloromethane. 1g of mPEG carboxyethyl NHS ester (mPEG-O-CH2-CO-NHS, molecular weight 5000) and 0.1 ml of triethylamine were added to the solution. The solution was stirred overnight. The solvent was removed under vacuum and the residue was added to ethyl ether. The precipitate was collected by filtration and dried under vacuum. The product (Y-shape branched PEG acid) was further purified by ion exchange chromatography. Yield: 0.98g (50%). 0.5g of Y-shape branched mPEG acid was dissolved in 10ml dichloromethane. 7mg of N-hydroxylsuccinimide (NHS) and 13mg of dicyclohexylcarbodiimide (DCC) was added to the solution. The solution was stirred at room temperature for 6 hours. The solvent was removed under vacuum. The residue was added to 20 ml of isopropyl alcohol (IPA). The product was collected by filtration and dried under vacuum. Yield: 0.48g (96%), NMR (DMSO): 3.5 (br m, H in PEG), 3.24, (s, 6H), 2.81 (s, 4H), 4.15 (s, 2H), 4.07 (t, 2H), 4.48 (t, 2H). Example 6 Synthesis of Y-shape branched PEG derivatives (6) reactive toward amine group. 0.5g of Y-shape branched mPEG acid was dissolved in 10 ml dichloromethane. 7mg of N-hydroxylsuccinimide (NHS) and 13mg of dicyclohexylcarbodiimide were added to the solution. The solution was stirred at room temperature for 6 hours. The solvent was removed under vacuum. The residue was added to 20 ml of isopropyl alcohol. The precipitate was collected by filtration and dried under vacuum. Yield 0.48g (96%). NMR (DMSO): 3.5 (br m, H in PEG), 3.24 (s, 6H), 2.81 (s, 4H), 4.15 (s, 2H), 4.07 (t, 2H). Example 7 Synthesis of Y-shape branched PEG derivatives (7) reactive toward thiol group. 0.5g of Y-shape branched PEG amine ((MeO-PEG)2-N-CH2CH2NH2) was dissolved in acetonitrile. 20 mg of NHS-3-maleimidopropionate was added to the solution. The solution was stirred overnight at room temperature. The solvent was removed under vacuum. The residue was added to 30 ml isopropyl alcohol. The precipitated was collected and dried under vacuum. Yield: 0.42g (84%). NMR (DMSO): 3.5 (br m, H in PEG), 3.24 (s, 6H), 3.05 (t, 2H), 2.56 (t, 2H), 6.71 (s, 2H in maleimide). The synthesis is shown in Fig. 7. 75mg Y-shape branched polyethylene glycol succinimidyl ester (from example 2, 5 or 6) was dissolved in 5 ml of buffered α-interferon solution with interferon concentration 5 mg/ml (pH 7.4). In the reaction solution PEG and α-interferon were at ratio of 3:1. The solution was gently shaken for 1 hour at 4 °C and then 5 hours at room temperature. The solution was diluted to a final interferon concentration of 0.5 mg/ml and purified by HPLC with gel column. The mono-substituted Y-shape branched PEG conjugate of α-interferon was collected. SDS-PAGE showed the product contained no free α-interferon. SDS-PAGE Analysis: Reaction mixture and the purified PEG-IFN was subjected to sodium dodecyl (lauryl) sulfate/polyacrylamide (8-16%) gel electrophoresis and stained for protein using Coomassie blue dye. PEG moieties in the PEG2-IFN conjugates were specifically stained using Titrisol iodine solution (EM Science, Gibbstown, New Jersey). The SDS-PAGE gel was rinsed with distilled water and placed in 5% barium chloride solution. After 10 min, the above gel was washed with distilled water and placed in 0.1 N Titrisol iodine solution for another 10 min. Titrisol was washed off with distilled water. The PEG stained (orange brown bands) SDS-PAGE gel containing Y-PEG-IFN samples was stored in distilled water in a heat-sealed Kapak/Scotchpak bag. Y-shape branched polyethylene glycol succinimidyl ester (Example 5 or 6) was dissolved in 5 ml of buffered β-interferon solution with interferon concentration of 1 mg/ml (pH 7.4). In the reaction solution, PEG and β-interferon were at ratio of 3:1. The solution was gently shaken for 7hours. The solution was purified by HPLC with gel column. The mono-substituted Y-shape branched PEG conjugate of β-interferon was collected. SDS-PAGE and CE showed the product contains no free β-interferon. The synthesis is shown in Fig. 5. 1g of Y-shape branched PEG carboxylic acid (from Example 5 or 6) was dissolved in 10 ml dichloromethane. 90 mg of paclitaxel, 8 mg of dimethylamino pyridine and 25 mg of dicyclohexylcarbodiimide were added to the solution. The solution was stirred at room temperature for 6 hours. The solvent was removed under vacuum. The residue was added to 20 ml of isopropyl alcohol. The precipitate was collected by filtration, washed with ether and dried under vacuum. Yield: 0.8g (80%), Mp: 55-57°C. The synthesis is shown in Fig. 6. 1g of Y-shape branched PEG carboxylic acid (Example 5 or 6) was dissolved in 10 ml dichloromethane. 120 mg of glycine-camptothecin, 50 mg of dimethylamino pyridine and 95 mg of dicyclohexylcarbodiimide were added to the solution. The solution was stirred at room temperature for 6 hours. The solvent was removed under vacuum. The residue was dissolved in 20 ml of 1,4-dioxane. The precipitate was removed by filtration. The solution was concentrated, and the residue was added to 20ml of ethyl ether. The precipitate was collected by filtration, washed with ethyl ether and dried under vacuum. Yield: 0.8g (80%), Mp: 56-58°C. The synthesis is shown in Fig. 5. 1g of Y-shape branched PEG carboxylic acid (Example 5 or 6) was dissolved in 10 ml dichloromethane. 60 mg of Cinobufagin, 12 mg 1-Hydroxybenzotriazole, 16 mg of dimethylamino pyridine and 40 mg of dicyclohexylcarbodiimide were added to the solution. The solution was stirred at room temperature for 6 hours. The solvent was removed under vacuum. The residue was added to 20 ml of isopropyl alcohol. The precipitate was collected by filtration, washed with ether and dried under vacuum. Yield: 0.75g (75%), Mp: 57-59°C. The synthesis is shown in Fig. 5.1 g of Y-shape branched PEG carboxylic acid (Example 5 or 6) was dissolved in 20 ml of dichloromethane. 30 mg of Cinobufagin, 20mg of 1-Hydroxybenzotriazole, 20 mg of dimethylamino pyridine and 38 mg of dicyclohexyl- carbodiimide were added to the solution. The solution was stirred at room temperature for 12 hours under the protection of nitrogen. The solvent was concentrated under vacuum. The residue was added to 20 ml of 1,4-dioxane. The precipitate was collected by filtration, washed with ether and dried by air exhaust. The solvent was removed under vacuum. The remaining residue was added to 100 ml of isopropyl alcohol. The precipitate was collected by filtration, washed with ether and dried by air exhaust. The precipitates were combined and dried under vacuum. Yield: 0.92g (92%), Mp: 56-58 °C. The synthesis is shown in Fig. 6. 1 g of Y-shape branched PEG carboxylic acid (Example 5 or 6) was dissolved in 10 ml of dichloromethane. 0.2 ml of thionyl chloride was added to the solution. The solution was stirred for 2 hours. The solvent and impurities having low boiling point were removed under vacuum. 10ml of dichloromethane solution having 70 mg clycyrrhetinic acid was added, and dissolved by mixing. Then 60mg 4-dimethylamino pyridine was added. The reaction mixture was stirred for 12 hours at room temperature under the protection of nitrogen gas. The solvent was concentrated under vacuum. The residue was added into 20ml of isopropyl alcohol. The precipitate was collected by filtration, washed with ethyl ether, dried by air exhaust, and further dried under vacuum. Yield: 0.6 g (60%). M.p. : 58~60 °C. This example is to illustrate the preparation process of a typical pharmaceutical composition administered parenterally. The composition comprises the conjugate of the present invention. The conjugate prepared in Example 8 was dissolved in 0.9% saline to obtain 100ml solution for intravenous injection, which was filtered through 0.2 µm membrane and packed aseptically. The powder for injection was obtained by freeze-drying. X1 and X2 independently are linking groups, wherein X1 is (CH2)n, and X2 is selected from the group consisting of (CH2)n, CO and (CH2)mCO, wherein n and m are independently an integer from 1-12. The hydrophilic polymer derivative of claim 1 wherein the hydrophilic polymer is selected from the group consisting of polyethylene glycol, polypropylene glycol, polyvinyl alcohol, polyacrylmorpholine and copolymers thereof. The hydrophilic polymer derivative of claim 2 wherein the hydrophilic polymer is polyethylene glycol. A Y-shaped branched polyethylene glycol derivative represented according to claim 1, wherein Pa and Pb are polyethylene glycols, which are the same or different and X2 is (CH2)n.
A Y-shaped branched polyethylene glycol derivative according to claim 1. wherein Pa and Pb are polyethylene glycols, which are the same or different and X2 is (CH2)nCO. A Y-shaped branched polyethylene glycol derivative according to claim 1, wherein Pa and Pb are polyethylene glycols, which are the same or different and X2 is CO.
n is an integer, representing the degree of polymerization. The derivative of claim 7, wherein R is selected from the group consisting of H, methyl, ethyl, isopropyl, cyclopropyl, cyclobutyl, cyclohexyl and benzyl. The derivative of claim 7, wherein the molecular weight of PEG is from about 300 to 60000.
derivatizing the new hydroxyl group to incorporate the terminal group F..
reacting the reactive product obtained above with another methoxyl polyethylene glycol derivative, and further derivatizing to incorporate a terminal group F.
The method of claim 11, wherein the another methoxyl polyethylene glycol derivative is mPEG-carboxyethyl NHS ester. A conjugate formed by reacting the derivative of any one of claims 1, 4, 5 and 6 with drug molecules through the terminal group F, preferably a drug molecule selected from the group consisting of amino acids, proteins, enzymes, nucleosides, saccharides, organic acids, glycosides, flavonoids, anthraquinones, terpenoids, phenylpropanoid phenols, steroids, glycoside of the steroids and alkaloids. A copolymer of the derivatives of any one of claim 1, 4, 5 and 6 and other polymers linked through the terminal group F.
The conjugate of claim 13 wherein the drug is an active component of a natural medicine, preferably cinobufagin, clycyrrhetinic acid or scopoletin. The conjugate of claim 13 wherein the drug is an anti-tumor agent, preferably selected from the group consisting of paclitaxel, camptothecin, interferon and derivatives thereof. The conjugate of claim 16 wherein the interferon is α -, β -or γ - interferon. A pharmaceutical composition comprising the conjugate according to any one of claims 13 to 17 and optionally a pharmaceutically acceptable carrier and excipient. ES2242396T3 (en) 2005-11-01 Conjugates PEG-LHRH analogs. Owner name: BEIJING JIANKAI TECHNOLOGY CO., LTD.